Your skin is your first defense against all the toxins and radiation you're bombarded with everyday. Since it takes the brunt of the damage, it's often the first thing to show the effects of aging- like those nasty wrinkles and age spots we try so hard to get rid of! When free radicals break down the collagen in your skin, you get wrinkles and loss of elasticity. When they damage your melanocytes, you get age spots. All of those toxins and radiation we're exposed to everyday are major sources of free radicals. They damage your skin cells the same way they damage your internal cells. To truly understand why antioxidants in skin care are so important, you need to understand how important antioxidants are for stopping free radicals. Click here to learn all about it. Here's why antioxidant skin care is necessary: most of the free radical damage is the result of radiation from the sun- even the small exposure you get from going to work or running errands adds up. 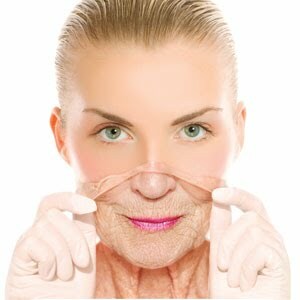 That of course makes wearing sunscreen EVERYDAY the ultimate in aging prevention. Unfortunately, the key word is prevention. By the time most of us have figured this out, a lot of the damage has already been done. That's where antioxidant skin care comes in. If you can get enough antioxidants in your skin cells, free radical damage would be minimal. That would virtually stop the aging process in it's tracks. Imagine! Beware the antioxidant claims made by most skin care companies as they try to profit from this "trend" though. It is a complex process to effectively put antioxidants into skin creams. Most companies don't bother with the expense. Since claims do not need to be substantiated, MOST (over 95%) of the products that claim to have antioxidants in them either do not at all, or they are quickly inactivated once the product has been opened. And price is no indication of quality!!! Trust me! Find out exactly how to evaluate antioxidant skin care products and not get ripped off by going to my antioxidants skin care products page. And don't forget your antioxidant supplements! They're probably even more important for your skin than any cream you could put on. The antioxidant protection will be built right into the cell, where the free radical damage happens. Click here to find out more about internal antioxidants skin care products. Or click here to find out how to find the best topical antioxidants skin care products. Have A Question or Comment About This Topic? Have a question, tip or interesting story about antioxidant skin care? Post it here- there is no member login or registration required.